There’s an enormous amount of generational leadership change that’s happening in our arts and cultural organizations. And while people may liken succession planning to a form of disaster preparedness, Old Sturbridge Village – the largest outdoor history museum in the Northeast – sees it differently. Jim Donahue, President and CEO of Old Sturbridge Village, discusses their intentional processes around leadership change – how it’s not just about the end of a person’s tenure, but about sustaining a strong organization (even if nobody leaves). Jim Donahue is highly regarded in the non-profit sector as a collaborative visionary. He is recognized as one of the top non-profit executives in New England with an impressive background in leadership, education, and fund-raising. 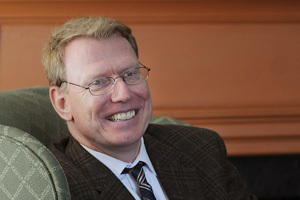 Prior to taking the position as President and CEO for Old Sturbridge Village, Donahue was the CEO of the Bradford Dunn Institute for Learning Differences in Providence, RI. The Institute operates a network of high-quality programs that include The Hasbro Center for Teaching Excellence, the RI Tutorial and Educational Services, and the CVS Highlander Charter School, which Donahue founded in 2000. Donahue negotiated the merger between the Bradford Dunn Institute and CVS Highlander Charter School in 2004. During his seven year tenure as the director of the charter school, he led the renovation of two campuses for the school and the establishment of several key capacity-building partnerships. Since taking over as OSV President in 2007, Donahue has led the institution through a renaissance by increasing attendance, fund-raising and revenue from special programs. Highlights of his tenure include the reopening of the museum’s restaurant division, the renovation and reopening of the lodging complex, the creation of the Ken Burns Lifetime Achievement Award and the expansion of popular events, like Christmas by Candlelight and Fourth of July. In 2010, he was named nonprofit leader of the year by the Worcester Business Journal, and in 2013 received the Larry Meehan Award from the Massachusetts Office of Travel and Tourism. He is a member of the American Antiquarian Society, a fellow of the Massachusetts Historical Society and has served on the boards of a number of Rhode Island nonprofits including City Year Rhode Island, Providence Summerbridge and Providence City Arts for Youth. Donahue graduated from Colby College in 1988 with a B.A. in Economics and Harvard Business School in 2006 for Executive Development. Informative and lively conversations with arts and cultural leaders, hosted by the Mass Cultural Council.